A lot of exciting things are happening at Sogeti in Michigan. We hired a new leadership team about a year ago; we recently realigned our region with the offices in Columbus and Cleveland; and we moved our Detroit office from Farmington Hills to Southfield on January 1. To celebrate our move to a much nicer home, Sogeti is hosting an open house tomorrow, February 13 at 6PM. The event begins with plenty of past and other Italian food from Buca di Beppo, which is why we’ve titled this event “Sogeti and Meatballs with a Side of Technology”. Three Sogeti consultants will be giving technical presentation during the evening: Sogeti Mobility Lead Samidip Basu will talk about Windows 8; Sogeti Managed Testing Practice Manager Matthew Eakin will present The "New" Tester: How Agile is changing the Testing Skillset; and I will deliver an introduction on Cloud Computing and Windows Azure. The purpose of the event is to introduce or re-introduce Sogeti to the Detroit technical community; however, it’s also a great opportunity for you to learn something and to network with your peers. 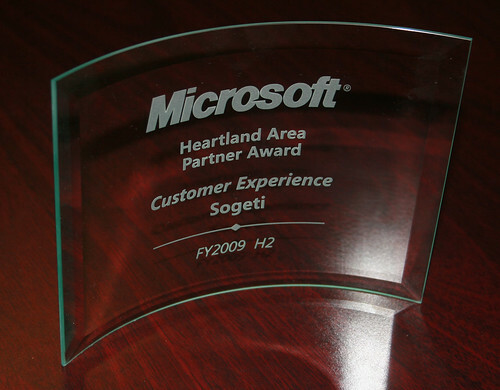 I have been working for Sogeti for almost exactly a year now and I'm proud to announce that Microsoft has awarded our team the Partner of the Year award. Although the award goes to the entire unit, it was given for a SharePoint intranet portal produced for Oakland County and most of the work on that project was done by Mike Hacker. Congratulations to Mike and to Sogeti on this prestigious award.